ATEN UH3234 is a USB-C multiport dock with power pass-through. 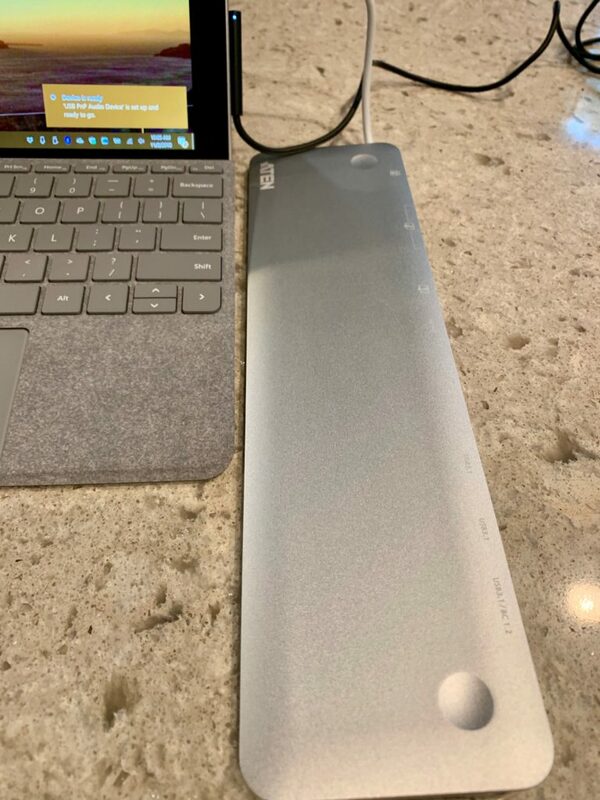 The dock includes ports for USB 3.1 A, HDMI, DisplayPort, VGA, Ethernet, SD, and MicroSD, plus audio and a pass through power port with USB-C. It is in a wedge shape and comes in aluminum. Packaging is neat and well designed. The box includes the dock and instructions. As with most hubs and docks, there is little to no setup needed. Plug in the dock to an available USB-C port and start attaching your peripherals. A Windows PC will need to install a driver first, however Windows 10 took a few seconds to get the dock recognized. 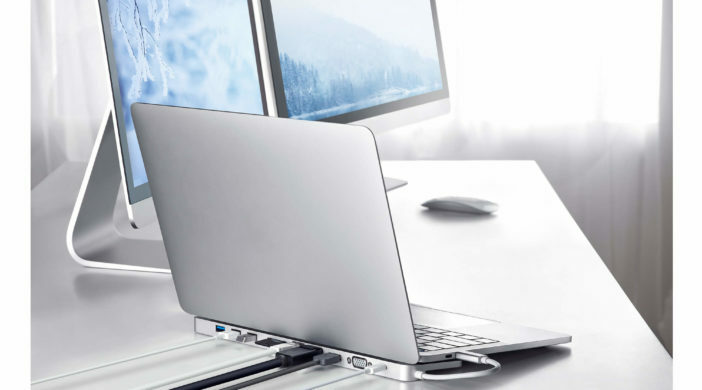 The dock is designed to go under the back of your laptop to elevate it. This will allow the ports to be easily accessible in the back and well as give you a raised keyboard. Optionally you can plug in a USB C charger into the pass through port and charge your laptop. 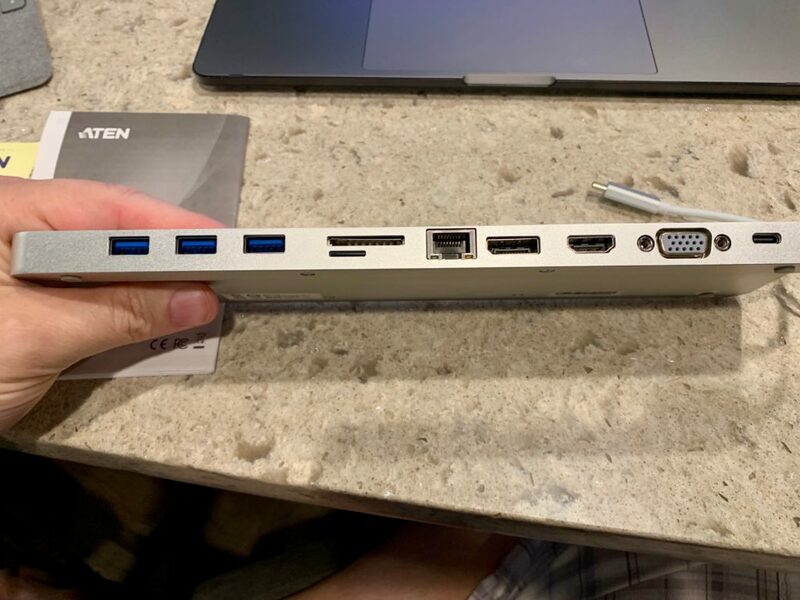 ATEN states that the UH3234 provides up to 60W of pass though power which will be fine for a 12 or 13 inch MacBook or MacBook Pro, and probably the new MacBook Air. Testing was done using a 2017 13 inch MacBook Pro and a Microsoft Surface Go. Plugging in a USB A flash drive in both Windows and Mac OS worked fine. The drive was usable on all three USB A ports on the dock. The USB A port on the right of the dock supports charging and charges an iPhone XS Max easily. The Ethernet, SD card and audio ports all worked as expected. Lastly, hooking up a monitor using both using HDMI and VGA worked as expected. Keep in mind that the MacBook can only drive one 4K monitor while Windows can drive two 1080p monitors. The UH3234 actually looks and feels terrific. It is probably the most attractive dock I have used. The wedge shape makes the laptop nice to use with the ports easily accessible in the rear and elevated typing. However, the elevated keyboard is only useful when the lid is open and not in clamshell mode. I also found that it’s a little difficult to access the rear of the dock when the lid is open. One other concern is that the unit doesn’t have any USB C ports except for the pass through USB-C port which doesn’t support a USB-C device. 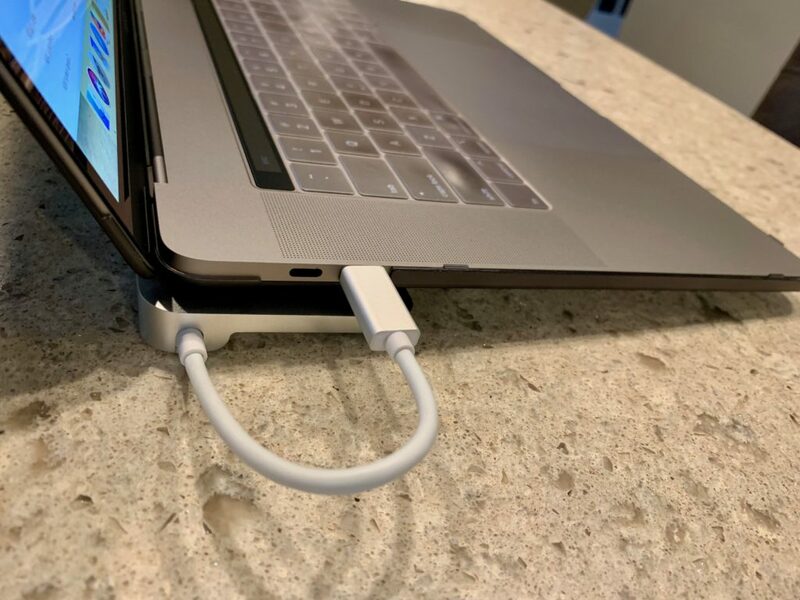 So if you only have one available USB-C port, such as the 12 inch MacBook or the Surface Go, you will lose the ability to plug in a USB-C device. At $175, the UH3234 is on the pricier side of USB-C docks. There are many no named brands that are in the sub $100 range, however reputable branded docks are comparable in price. These are just minor issues, and the dock still looks great and works perfectly. MyMac Review Rating is 8 out of 10. Functional and very attractive makes this a great addition to your USB C equipped laptop. A USB C port on the dock and a slightly lower price would improve the rating.